Often used synonymously with “vegetable-centric,” “vegetable-forward,” and “plant-centric,” the plant-forward trend emphasizes and celebrates, but is not limited to, plant-based foods—including fruits and vegetables (produce); whole grains; beans and other legumes (pulses); nuts and seeds; plant oils; and herbs and spices—and that reflects evidence-based principles of health and sustainability, according to the 2017 Annual Report from Menus of Change. College students, in particular, have embraced plant-forward cuisine. Twenty percent of college students follow some form of special diet, ranging from semi-vegetarian to vegan, according to Technomic’s 2017 College & University report. Additionally, 38% of Gen Zers say they would be more likely to visit restaurants (or other foodservice locations) if they offered healthier options, according to Technomic’s recent Generational report—and often, plant-forward cuisine is seen as a better-for-you choice. In response, college and university foodservice operators are focusing on food that’s fresh, healthy and sustainably sourced. They’re changing the types of food prepared and purchasing more locally grown items. Eighty-one percent of C&U operators are actively engaged in incorporating vegetarian options, while an additional 12% say they plan to do so soon, according to Technomic’s College & University report. In 2012, The Culinary Institute of America (CIA) and Harvard T.H. Chan School of Public Health —Department of Nutrition launched Menus of Change (MOC), an ongoing initiative to advance better food choices and menu development at the intersection of health, sustainability imperatives, culinary insight and next-generation business strategy. With the success of the initiative’s annual MOC Leadership Summit, the CIA and Stanford University launched a complementary initiative: Menus of Change University Research Collaborative (MCURC). This project aims to promote sustainable choices at universities to raise awareness among students of the impacts of their food choices later in life. This initiative leverages the unique position of universities to advance healthier, more sustainable life-long food choices among students by connecting a diversity of insights from academic programs, dining services and athletics. “Think Produce First”: By purchasing locally grown produce, when available, offering a 40-foot salad bar in the main dining hall that features a variety of fresh and frozen fruit and vegetables and preparing a variety of plant-based main dishes and vegetable side dishes offered at every meal. “Make Whole, Intact Grains the New Norm”: By serving brown rice daily at the stir fry station, steel cut oats every morning for breakfast, whole-wheat bread daily and quinoa and other ancient grains on the salad bar. 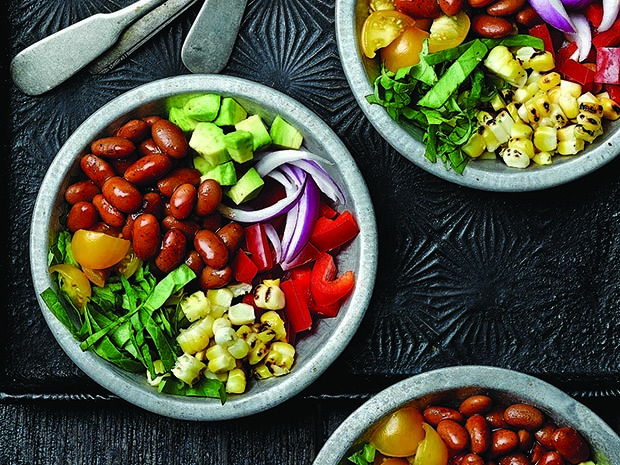 “Move Nuts and Legumes to the Center of the Plate”: By increasing and rotating the amount and types of legumes used in recipes and expanding the availability of legumes in the salad bar. Access to reference guides and identification icons for specific food choices, such as organic, vegetarian and vegan. Locally food sourced from over 50 businesses within a 300-mile radius. Dining halls across C&U continue to undergo changes as student demands grow for food choices that are healthy, sustainable, locally sourced, convenient and affordable. Plant-forward cuisine is increasingly looking like an solution to stay on-trend and meet student demand.